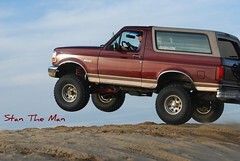 Ford Bronco Forum > Other Forums > General Discussion/ Bronco and Wheeling related. > New FOTY 2018 Skin? BikerPepe`, itwasFREE!!!! and White Dragon like this. itwasFREE!!!! and sackman9975 like this. BikerPepe`, jopes and itwasFREE!!!! like this. I moved this thread out of the FOTM section to keep it from auto bumping automatically. The blue threw me off, but I dig it now! Great work on the banner image. Color scheme is a bit over-matched but I'll sport it for awhile and see if it grows on me. Glad to see this finally got taken care of and we can all dig on FOTY 2018 now. Might want to make a small announcement or something for folks that don't find this one thread. I wouldn't have known otherwise. BikerPepe`, sackman9975 and 445 FE Bronco like this. Eeh..... Maybe, but it's sharp as hell. I totally dig it! BikerPepe`, Quader1 and 445 FE Bronco like this. BikerPepe`, sackman9975 and Quader1 like this. I have to admit... it's growing on me fast. Love that banner work though. I always use the most current FOTY theme, so this wasn't a big change. Blue/Gray = Ford Engine Bay. sackman9975, Quader1 and 445 FE Bronco like this. Very nice layout! Me like! Not real keen on Blue tho. Changed it to Red! Noticed things changed a few days ago, the format looks awesome! I have to agree; IT"S A LOT OF BLUE ! but, it is starting to grow on me.